Tragically, the G.B. Linderman association with Fishers Island was fated to be short. Circa 1905, Mr. Linderman became heavily involved with mining speculators, specifically with the Heinz group that tried unsuccessfully to corner copper. This failed attempt triggered the fiscal crisis known as the “Panic of 1907” during which approximately one hundred banks failed. (The Federal Reserve, so much in the news today, was established in the wake of this panic.) By the time it was all said and done, Garrett B. Linderman, once one of Pennsylvania’s wealthiest citizens, was so reduced that he “borrowed” —others said “stole”— $53,000 that belonged to the estate of a dead cousin. Accused of embezzling the funds, he ultimately confessed and was sentenced to jail in 1908. 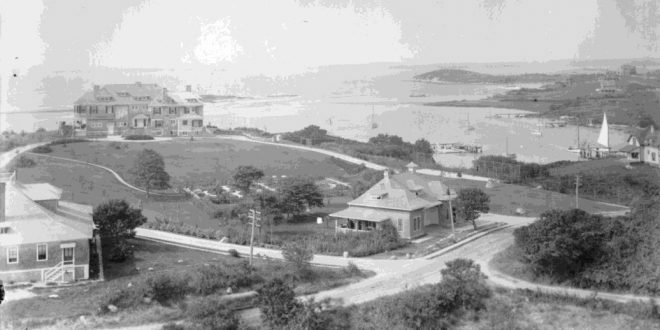 Although the length of his sentence is not clear, it is known that by 1909, following a declaration of personal bankruptcy, his former bank, Lehigh National, assumed total control of the property on Fishers Island. In May 1914, Alma Gluck, world famous opera star and recording artist, came to Fishers Island as a guest of A.F. Adams, an impresario who owned a house here. Mr. Adams represented some of the leading concert and theatrical artists of the day, including Miss Gluck. (The A.F. Adams’ house, later the Lamborn house, is currently owned by Lucinda Herrick.) One month later, in June 1914, Miss Gluck married Efrem Zimbalist Sr., a renowned master violinist. During one of their subsequent visits to Fishers, the couple took note of the G.B. Linderman house, a property that was still owned by the Lehigh National Bank. In 1917, they rented the house for a season and evidently liked it; the following year, in February 1918, Alma Gluck bought the house and property from the bank. Perhaps they were looking for more space as Alma was expecting. Efrem Zimbalist Jr., the actor, was born in November 1918, several months after the purchase. The former G.B. Linderman mansion remained the Gluck/Zimbalist primary summer residence through most of the 1930s; however, after Alma’s death in 1938, it was less utilized and all but abandoned during World War II. In 1946, Barron Kidd, Sr. purchased the property and residence from the Gluck estate. Subsequent purchasers were: Mrs. Onolee Coffee (1968); Helene and Elinor Van Oosten (1980) and Peter and Katie Bacille, today’s owners (2004). The Bacilles have recently completed a major restoration of the residence. It’s worth noting that G.B. Linderman’s fiscal impropriety opened the door on Fishers Island to an impressive array of musical talent. Soon after they purchased his home, Alma Gluck and Efrem Zimbalist Sr. hosted some of the most influential musicians of the 20th century, including violinists Fritz Kreisler and Jascha Heifetz. Enrico Caruso was also likely a visitor. Local legend has it that he gave a private performance while a guest at the nearby A.F. Adams residence.